Everyone loves to knock Salesforce (NYSE:CRM) for its valuation. 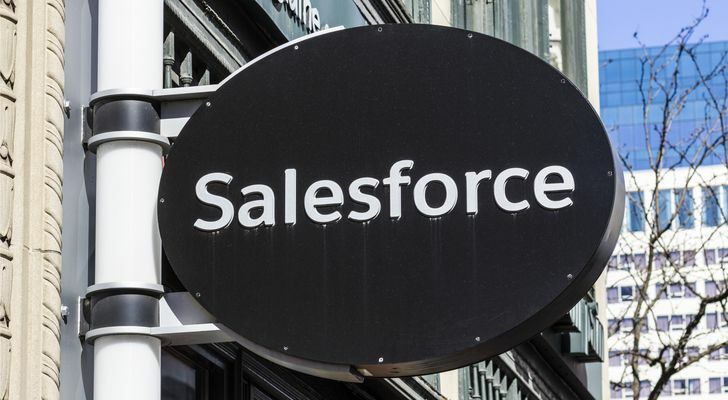 But like Amazon (NASDAQ:AMZN), Netflix (NASDAQ:NFLX) and others, Salesforce stock has been one of the bull market’s top performers despite its lofty valuation. Too many investors look at or hear what Salesforce is doing and want in. Then they see the valuation and say no way. I too was one of those investors. I won’t pretend I bought the stock in 2008 and held through all the volatility, but props to the people who did and bagged a 1,500% return! But I did eventually close my eyes and bite the bullet. The reason why is simple: Salesforce is building a “must have” platform with powerful customer relationship management (CRM) tools. While that comes at the sacrifice of today’s profits, when those expenses dry up and Salesforce has significantly increased its number of subscription-based revenue clients, the profit potential is monstrous. Some people will read that and laugh, but that’s fine. I’ve been hearing the doom-and-gloom for CRM, Netflix, Amazon and others for years at this point. Amazon is a great example of a company sacrificing profits today to invest in tomorrow and to build out future revenue streams; no, rivers. If Amazon simply focused on profit growth in 2008 or 2012 or any other year, its cloud services business may not even exist, let alone be a market leader. Amazon’s Prime membership would have been frowned upon for its free two-day shipping shenanigans. Buying a low-growth, low-margin grocery retailer would have drawn all sorts of investor outcry. But these types of invest now, reap later plans are exactly what got AMZN to a $1 trillion market cap. I don’t suspect that Salesforce will hit the $1 trillion mark, but I think it’s still got room to go. We’ve been pretty steadfast here on InvestorPlace that the cloud industry is still in its early innings. It was a hot topic for a while that lost some of its luster, but that luster has come back with a vengeance over the last four to six quarters. Whether that’s Salesforce, Adobe (NASDAQ:ADBE), Microsoft (NASDAQ:MSFT), Amazon, Twilio (NYSE:TWLO) or dozens of other names, the cloud space has been robust. That’s going to stay that way for a while and CRM is a great way to play. But how do we value it? Forecasts call for 25% revenue growth this year and 20% in 2019. By most accounts, Salesforce should eclipse the $20 billion sales mark in fiscal 2022 (calendar year 2021). While a ways off, it would represent significant growth from the ~$13.2 billion in sales this year. Earnings are expected to grow more than 85% this year to $2.50 per share. That puts CRM at about 57 times this year’s earnings. Lofty I know, but more reasonable than it has been over the past few years. Plus, we’re talking about compound annual sales growth in excess of 20% for the foreseeable future. Free-cash flow is hitting the accelerator, doubling from $1 billion in fiscal 2016 to more than $2.2 billion in fiscal 2018. So profitability and cash flow are on the upswing and revenue growth remains strong. Those figures should continue higher and as clients become “regulars,” those trends should continue. That said, even after the latest pullback, we’re still talking about a stock that trades at 8.25 times this year’s sales, 57 times earnings and is still up 50% over the last 12 months. Admittedly CRM stock is still expensive, but my argument is that valuation has never tied CRM and several other names down. Secular trends will continue to power Salesforce stock higher and justify the valuation and until we’re in a recession or bear market, Salesforce will likely trend higher. Lastly, while it’s expensive, Salesforce stock is actually cheaper than most of its peers in the cloud, despite having some of the best-looking fundamentals on the cloud block. If you still hate the valuation, then maybe the chart is for you. Salesforce stock is hitting its most turbulent patch over the past 12 months. Each pullback to the 60-day and 100-day moving averages have been big-time buying opportunities. That trend could be breaking though, as it’s now below both marks. 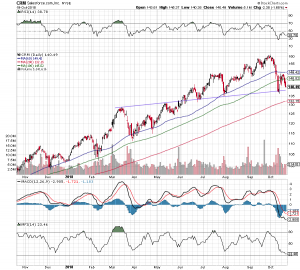 If CRM takes out this month’s lows, a test of the 200-day is likely on the table. 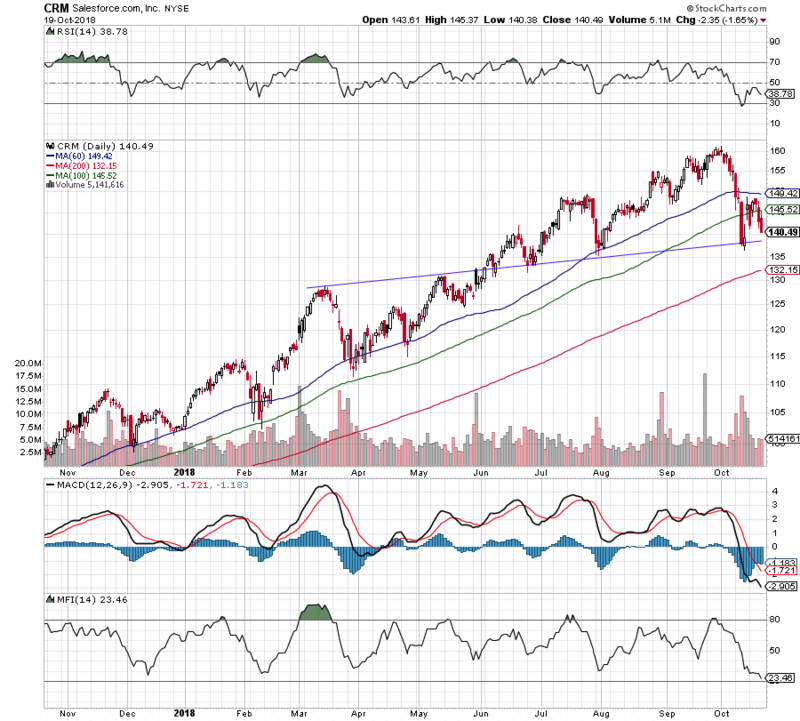 That would mark a decline of almost 20% from the highs and would, at the very least, be good for a bounce in CRM. Bret Kenwell is the manager and author of Future Blue Chips and is on Twitter @BretKenwell. As of this writing, Bret Kenwell is long CRM. Article printed from InvestorPlace Media, https://investorplace.com/2018/10/market-gifting-salesforce-stock/.